HeadSweats (HERE) Perspiration Technology Headwear® was founded in the winter of 1998 by shoe industry veteran and obsessed cyclist, Alan Romick. Frustrated by the perils of heavy sweat blindness, migrating sunscreen, and odd sunburn pattern on his head through his helmet, he set out to develop headgear that worked. Encouraged by the constant feedback within the local cycling community, he took the best attributes of what was available and improved on them. Starting with one product -- The Cotton Classic -- available at first in just four colors, Alan’s products quietly became elite athlete’s secret weapon around the world, eventually expanding to over 17 different products available in over 140 different colors and styles. I received the HeadSweats GO Hat (HERE) in pink/white and loved it. The sun has been shining a bit lately and it was nice to get it out of my eyes -- as much as I DO LOVE my Bondi Bands! It's also great to pop on my head when I don't feel like doing my hair when the kiddos and I head to the park!! During my six miler with the Little Dude, it kept the sun out of my eyes, my hair out of my face (from the crazy wind) and kept my head cool. The terry sweat band kept my head cool, the hat in place and wasn't too tight. I hate wearing hats sometimes, because it gives me a headache from squeezing my pressure points. I didn't experience this with the Go Hat. It was cool and comfortable. Only downfall I can see as the white could get dirty pretty fast with as much of a sweaty-betty I am! And those of us that run with makeup on can cause a bit more of a problem with a white hat and the washing machine!! But, performance-wise it was perfect and I loved having the opportunity to try it out. Available in womens sizing and in 5 female-friendly color combinations, the GO Hat is sold for $22. Enter now though Thursday, June 2nd. With all of the miles I have under my belt, I've hardly played around with insoles. After scouring the internet earlier this year, it appeared that Sof Sole (HERE) sold some of the most popular Insoles (HERE). I have always had foot problems, bunion problems, pain in my toes and on the sides of my feet and in my arches. It's been a bit easier this year, because I have yet to tackle marathon training again. But, that is right around the corner. I'm dreading the pain and icing of my feet again. I figured I would give some trusted insoles a try. I received a set of Womens' Airr Insoles (HERE). The Sof Sole Airr insole is the first insole to combine an air cushioning system with moisture control technology. The Airr features an encapsulated air chamber for maximum cushioning and Coolmax top cover to provide climate control for the surface of your foot. Simply put, the Sof Sole Airr is the best performance insole available. I paired the insoles with an older pair of running shoes that have quite a few hundred miles on them. These babies felt like new again. I wore them on a 5K on the treadmill and a 5K out in my neighborhood. They really were comfortable in both forms and my feet were really happy. I can only imagine how these could affect my marathon training (which starts next month!). They felt slightly heavy when I took them out of the packaging, but didn't weigh down my running shoes or make my feet feel heavy. As far as moisture, my feet and socks didn't feel any different than they do in my socks after any other run. Little Diva was able to try out some Kids All Sport Lite Socks (HERE). She wore these around town, to school and at a local inflatable-bouncy place (where she was required to wear socks). They fit her comfortably and the moisture management design was perfect for our bouncing outing! Had seamless toes, which is perfect for my kids that fuss about the comfort of their socks in their toes. These socks are no-show and perfect for sports or wearing to school. The fun, bright neon colors make them perfect for summer, too! I was able to try out two different packs of Sof Sole socks. I tried the Coolmax Trainer low-cut sock, at left (HERE) and Anti-Friction no-show sock, at right (HERE). I really loved the seamless toe in both designs. I love low-cut socks, but sometimes get annoyed as they slip-down during a run. I wear a size 10 running shoe and wore a size Medium in both designs (for size 5-10 shoe) and they fit comfortable, didn't slip or bunch up during my runs. My running shoes didn't rub around my ankles. I REALLY loved how soft and comfortable the socks were. They were super comfy both before and after my runs. I appreciated the variety of colors I received in my three pack of Anti-Friction socks. It's always fun to mix it up with each running outfit. My feet stayed as dry as can be and I didn't experience any irregular rubbing and no blistering during my training runs. Enter now though Thursday, June 2. Yurbuds (HERE) are the number one sport earphones because they perform like no other earphone has before. Yurbuds Twist Lock into place for a secure fit that never falls out even under the most intense workout conditions. Yurbuds Earbud Enhancers provide an unparalleled level of comfort and fidelity with a fit that ensures the earbuds stay in your ears, even during the most strenuous physical activity. Light and Intense style Yurbuds Earbud Enhancers guarantee a perfect fit. Made from ultra-soft medical grade silicone for extreme comfort during extended listening periods. Yurbuds Earbud Enhancers are clinically proven to improve sound quality and deliver deeper, richer acoustics. Enjoy music and the world around you like never before. Yurbuds Earbud Enhancers are compatible with Jawbone® ICON & Jawbone® Prime headsets and are clinically proven to enhance the sound during your calls. Yurbuds Ironman Series headphones work with mp3 devices including Apple® iPod®, iPhone® supporting an industry standard 3.5mm (1/8”) gold plated stereo mini-plug for wide-ranging compatibility. Avid triathlete Seth Burgett, CEO of Yurbuds came up with the award-winning idea for custom fit earbud enhancers while participating in an Ironman competition. Yurbuds Earbud Enhancers were created for the human ear by athletes, audiologists, and engineers to stay in place, avoid pressure points, and provide a pain-free listening experience. Yurbuds Earbud Enhancers protect headphones from perspiration, even during the most intense workout sessions. The protective silicone of the earbuds ensures that rain or extreme humidity will stay out of the headphones. I reviewed a pair of pink Yurbuds last year and absolutely LOVED LOVED LOVED them! Anyone that knows me as a runner, knows that I rarely run with music outside. I love to get lost with my thoughts, listen to my surrounding and focus on my breathing and get in tune with my foot work. But, occassionally, I do like to crank up the tunes out on a run and never had been able to find any headphones that worked in my sweaty ears. That is until I received my pink Yurbuds last year. I love those earphones and they are the only ones that will stay in place for me and that aren't annoying. I'm pretty particular ... and these work awesome. I was ecstatic when I recently recieved a pair of Ironman series Yurbuds to try out. They are phenomenal, too! You will instantly fall in love, too! They continue to be extremely sweat proof and stay in place during your entire workout. The sound quality rocks and I simply couldn't ask for much more. I can't rave about Yurbuds much more, honestly. If you are a runner that constantly is listening to tunes during your training runs, you NEED to try these. They could totally change your workout. No more fidgeting with headphones, dealing with them falling out, messing up your mojo. These are awesome. Enter now though Thursday June 2. Since Sunglass Warehouse (HERE) was founded in 2002, their goal has been to provide an affordable alternative to high-priced designer sunglasses. They think it's important to offer customers the latest styles and the fashions they want, so they are always adding new products to the website and listening to customer feedback. Whether it's discount celebrity sunglasses or fashionable sun readers, you can find the most popular styles - for men and for women - at Sunglass Warehouse. They pride themselves with exceptional customer satisfacation with a focus on fast delivery and a 100% Satisfaction Guarantee. All of the sunglasses they sell block harmful UVA & UVB rays. I recieved a pair of SW Fashion Sport Style #9932 (HERE) in black. Retail value $14.95. Do you love the look of sporty sunglasses, but don't want something with revo lenses? These frames have a sporty vibe with a more fashionable look and provide UV400 protection. Each temple includes a metal adornment around the hinge. I chose these sunglasses because they were stylish and were suitable for a run or bumming around town. I tend not to be a wearer of sunglasses because I get headaches or easily annoyed by them. These fit comfortably while out on a walk and out on a run. I didn't experience any pain in my temples or on my nose. They didn't slide or bounce during the run either. I had a little trouble with "depth perception" out on this sunny run. But, I'm not use to running with shades over my eyes, so it could just be me?!!? I didn't realy like the shape of the shades for the shape of my face or head (my big noggin'). If I had been able to try them on in person, I probably would have opted for another pair of shades before I purchased. They just didn't look right on my face. I should have checked out their sunglass selection guide for different face shapes (HERE). There are a TON of other fun ... and affordable ... options for running and other sports (HERE). NOT putting that run off. I dropped the kids off this morning and to fill my time, I interviewed for another coaching position, had some chai and ran some errands. I have a million things on my to do list today, that I want to tackle before getting the kids back in a couple of loooong days. So, that I can maximize my time with them. (blogging included) It would have been so easy to put my planned six miler on the back-burner today. To say that I will do a double tomorrow instead. Or to just forget it. But, before I headed out this morning, I made sure I dressed in my running gear. 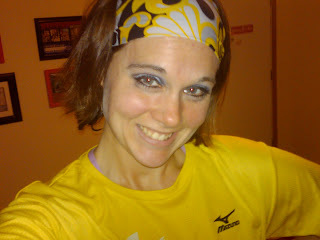 Remember that girly, yellow technical tee I received at the Lake Monona 20K last week? Well, it turns out I had the perfect Bondi Band to match it. Love it when that happens. So, I sported my fab new running outfit around town today and came home and IMMEDIATELY hopped on the treadmill. I was NOT putting that run off any longer. I was dressed to RUN. SIX slow and steady miles done. that I hopped on and did THREE more!! you don't skip a run?!?! Well folks, I believe I set a record for the number of likes on my Facebook status on Tuesday ... 43. Needless to say, I have a lot of friends and family that have been there for me over the most terrible ... and most incredible ... five months of my life. Many of these people came into my life only recently, after realizing that we have unfortunate common circumstances in my life. It's an unfortunate bond that ties us together. I'm officially a single running mommy of two munchkins and couldn't be more excited about my future with the kids. There may be some debate about how I can be happy about my children coming from a broken home. But, I am happy that they will have two newly happy parents who both still love them very much. I am confident that Little Diva and Little Dude will have TWO homes filled with love. Whether my home is big or small or whether I am with them half of their waking hours or away, they will know that I love them and that I am truly happy. So last evening, over three fun hours at a local pub, I celebrated with over 50 friends and family members ... and their spouses and children. The place was packed with familiar faces ... old and new ... little kids and baby carriers ...and smiles and hugs all around. This was not a divorce party. It was a celebration of my new beginning. A fresh start. A path to true happiness. I was ecstatic to see Chelsea (HERE) from Early Runner and her husband join me for the evening. Some of the other local bloggers were unable to make it. The blogging community has been a tremendous support system for me. Some people may think that "virtual friends" aren't "true friends". But, I find it extremely amazing that complete strangers can be so supportive to someone that they barely know, other than through their words and photos. Getting my words out there, realizing that they are read, your comments and encouragement have been my therapy. Several of you have joined me for runs, helping me reach my goal of running a half marathon every month. Some of you have sent cards or gifts over the past five months. A quick email or Facebook post to let me know that I was on your mind. It's all meant soooo much. I thank you for helping me move on and push forward and strive to continue to reach my goals. I also would like to take this post as a public opportunity to thank my immediately family - my mom, dad and sister - for all of their support in every single way you can possibly imagine. They have continued to go above and beyond to help me and the kids out. Sometimes you don't realize what you have until you are in your most difficult moments. When you need someone to lean on. I've learned that I NEED to lean on someone sometimes. It doesn't make me weak. It's only makes me stronger. can enjoy the scenery while on a detour. I was given the opportunity to race the Prairie du Chien Half Marathon this past Saturday. However, with gas prices being what they are and the solo voyage roundtrip being over 250 miles, I sadly declined last minute and told them that I wasn't going to be able to race. I think it was a smart decision for myself and for my family. We also didn't have to get up at 4 am to leave for the race. And, I'm sure my kids appreciated that. 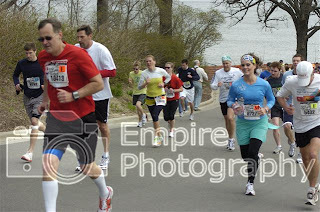 Instead, I joined friends that were signed up to run the Lake Monona 20K in Madison (HERE). The race was about 20 mins from my doorstep and last minute registration was very affordable. Being familiar with the course/area was also pretty cool. The 20K distance (12.4 mi) was just short of a half marathon, so I planned on putting in .7 mi before or after the race, to call it half marathon #5 in the books!! I wore my custom RDM technical tee and wicking headband from the wonderful dudes at Hidden Bay Sports (HERE). I received a lot of comments/questions about my blog during the race. It was a fun way to pass the time during the race. We headed out through residential neighborhoods for the first half of the race. There were a lot of hills and inclines, but I conquered them. I ran a really fast first 5k, just over 24 minutes. I was feeling great, passing folks left and right. I had a single goal in mind during the first half of the race .... to pace all the other chicks in brightly colored knee-high socks. There were actually quite a few of us out there .... and I think I did just that. Some of the hills were pretty steep and I slowed down a bit ... but never felt overly tired or fatigued. I was feeling phenomenal!! The second half of the race was refreshing. 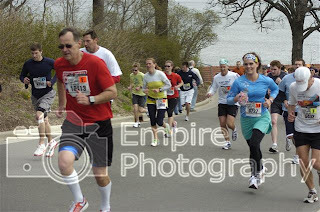 There was a nice breeze (as you can see from my stellar hairstyle in the race photos!). It seemed that the wind came and went at the perfect times, when I was starting to overheat. The breeze off the lake was welcomed and the scenery was beautiful. I love running on the path along Lake Monona. When we arrived at the Monona Terrace, I was greeted by another blogger that said she thought she'd heard of my blog and would stop by and check it out. She had just relocated to Madison from Boston and was a foody blogger. It was fun chatting with her. We then passed Machinery Row and headed into more residential areas along the lake. I carried my handheld water bottle with me, which was a blessing. It was warmer than it has been lately (lower 60's) and I was thirsty. My bottle was empty when I finished. It was nice not having to stop at the water stations, but I did stop three times for Gatorade, just to give me a little energy along the way. I also downed a second Powerbar Vanilla energy gel at mile 7, just over the one hour mark. Ugly race photo or not .... I felt great afterwards. 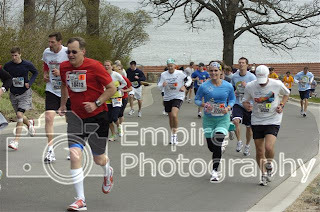 I was really happy with my time and enjoyed the journey around Lake Monona. I will definitely be doing this race again. Definitely. And, I raced a new distance, which means an automatic PR. The race shirt was a little girly (for the guys that raced), but perfect for me! The flowers and the yellow technical tee are a great addition (and added variety!) to my running wardrobe! 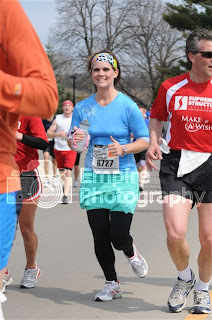 Next up .... Madison Half Marathon .... May 29th!! One of our favorite places to hang out in the summer is Sassy Cow Creamery (HERE). It's a short drive into the country from our home. I've also been known to ride out there by bike to enjoy an ice cream cone. Carb-loading for the ride back, right?!?! After school on Friday, I knew they would be looking for an after school snack, and I thought this would be a fun way to hang out, get Little Diva to talk about her day/week (since I hadn't been with her all week) and to enjoy a tasty summertime dessert. When we pulled up, Little Diva and I were both shocked by the amount of cars in the parking lot. Popular destination for a Friday afternoon! It turns out that Sassy Cow also offers free creamery tours on Friday afternoons. Sassy Cow has so many phenomenal flavors in their ice cream case. Good ol' standbys and creative concoctions. Our favorite is always the Birthday Cake flavor, which is similiar to Cold Stone Creamery's Cake Batter ice cream. We love it! Instead of getting cones, we always get a pint (for only $4) and share it. It's more fun for the kids ... and more affordable on this mommy's pocket book! They have a nice out patio outside with comfy seating, small chairs for the kids and tractors to play on. The kids always have a blast. Where else can you get some ice cream and sit outside, enjoy the countryside and let the kids play? Of course, Little Dude enjoys all things pink and girly, due to my little obsession with pink (and that he has an older sister!)! He always chooses the pink tractor over the green one. I'm looking forward to taking the kids back to Sassy Cow in a couple of weeks for our second trip of the season. Sassy Cow is hosting a Farm Adventure Weekend (HERE) May 21-22. Check it out if you will be in the Madison area. *Become a "Farmer for a Day"
*Be the first try their new release ice cream for Badgerland Financial. You will be able help name this ice cream, winner will receive a one year supply of this limited edition ice cream. Happy mother's day to all you beautiful mommies out there! I hope that you enjoyed your day and had a joyful celebration with your families. I did. And it all started with a sunny 6am wakeup call from Little Dude and Little Diva. They woke me up with huge grins on their faces and were all psyched to give me their gifts. Grandma had taken them shopping and worked on projects the week prior. I was told that Little Diva picked out very special, thoughtful gifts for me. I received a beautiful Mom necklace and a decorated cookie cake. They also selected a mother's appreciation wine glass to add to my collection of hand-painted wine glasses. But, my favorite gifts included this set of three Willow Tree figurines (which I collect). Little Diva hand-picked the three figurines to represent our new family .... and I love them (especially the mommy holding the home). I'm told that the lady from the Hallmark store was heartwarmed by Little Diva's thoughtful choices. The kids also recorded their voices in a scrapbook filled with recent photos of them. I also received some great handmade items from home and school. My favorite was a card that Little Diva made. Some of the laughs were that my favorite music is John Mayer, favorite color is dark pink and my favorite show is reality tv. She hit it all right on the head. The outside was decorated with all sorts of flowers, butterflies and other creatures from nature. She made them from hand-drawn hearts and said, "Mommy, can you find all 28 hearts?". My kid is so friggin' creative ... and artistic ... I adore her! We spent the day at a family cookout and the weather was fabulous! It's about time. I was beginning to wonder if spring was ever going to happen. It was nice just being able to sit out in my pink lawn chair and watch them play with their cousins, enjoy food and good company. We also got a nice walk in after lunch and it brought back some awesome memories I had from my childhood .... walking around town with my extended family and enjoying eachothers company. This time I was with my own children. A really nice moment. The kids and I got back to our home and I wanted to continue enjoying the beautiful day. I hadn't gotten my run in for the day (even though I ran a 20K yesterday) and asked them if they'd join me for my run outside. They agreed. I put on my "Running Mommy = Happy Mommy" tee ... and a Bondi Band ... and we headed out the door immediately. We headed out with the Little Dude in the Little Red Car and Little Diva on her pink scooter. We ventured out on our new neighborhood's bike path and did a 5K route and visited a new neighborhood park on our route. The kids had a blast and knew they were making my day. They kept saying, "Happy Mother's Day, Mommy." and "I hope this makes you happy" and "Thank you for letting me join you on your run.". They sure know how to get me!! 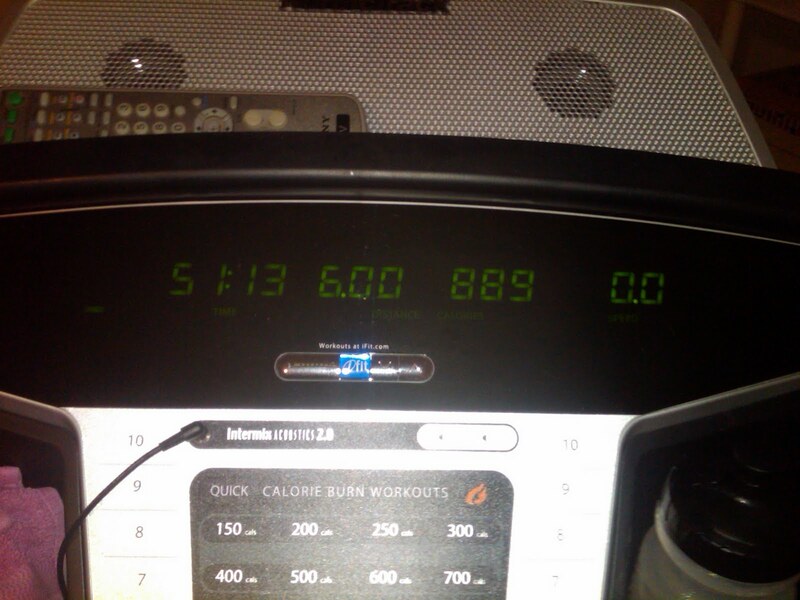 We went inside and the kids played and I finished off another 5K on the treadmill. It's time like this that make everything seem good again. Everything seem right. Everything seem perfect. It's just the three of us now. It's Mother's Day. And, I'm a single parent. I'm ok with it. It's perfect. 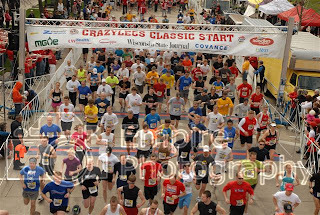 Last weekend I ran the 30th annual Crazylegs Classic 8K in Madison (HERE). I've participated in this race several times over recent years and it is always fun. Lots of people, lots of enthusiasm, just lots of fun. Early packet pick up was on Friday. Other than the usual Kohl Center location, you were also able to pick up your packet at Best Buy locations on both the east and west side of Madison. Since I had the day off, I opted to do Friday packet pick up at the east side location and figured it would save me a hectic trip downtown with a toddler. WRONG! Packet pick up started at noon and I showed up at 12:08. The line winded around the inside of the Best Buy store and I stood there with Little Dude, who was doing really well, until we hit the half hour mark. Then he started darting in between aisles and messing with the aisle dividers they set up. I didn't blame him. I was thinking it was pretty lame too. There were only three people at the front of the line, handing participants their goody bags and bib numbers. We ended up waiting in line for 45 minutes. I felt bad for all of the people that were standing there over their lunch hour. 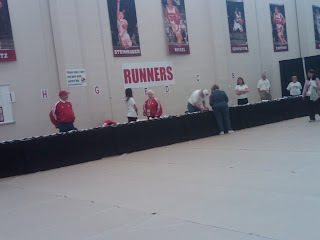 I then headed to the Kohl Center anyway, to pick up another runner's packet. The day was gorgeous and the parking lot next door was closed. So, Little Dude and I parked the marathon mommy minivan at a clinic down the street and took the opportunity to take a nice walk on the pedestrian path. It was a gorgeous afternoon and we were enjoying it. I showed up .... and surprise! .... NO LINES!!! LAME! I tried to get Little Dude to snap a pic with Bucky Badger, but it was a no go. We then headed on over to GiGi's Cupcakes to "carb load". We sat outside on their pretty pink bench and shared two of these beauties. They also were offering "Royal Wedding" cupcakes that day. Yum! Race Day morning, I dropped the kids off and headed downtown. Opted for blue instead of pink that morning! I was hoping to find parking in one of the public ramps, near State Street. This would have been an in between point, in between the start at the State of Wisconsin Capital and the finish line at Camp Randall Stadium on Campus. Lot was full and people were turning around 45 mins pre-race. I ended up forking over $10 to parking on the fourth level of the Fluno Center Parking ramp and walked to the start line. On the way, I stopped at the Overture Center on State Street, to do my usual last minute potty break. I headed up to the capital and there were plenty of port-o-potties and PLENTY of people waiting for them. Race time was quickly approaching in about ten minutes. The forecast was originally for 80% chance for Thunderstorms and low 60's that morning. The sun was out and the temps were great. I could have worn shorts and a short or long sleeve technical top. For some reason I wore tights under my running skirt and a long sleeve technical top. I felt warm for the race, but didn't overheat. I met up with a friend on the square and headed to Corral D. Keep in mind that I was placed in Corral M, based on my previous finishing times. Looking around, I felt way out of place, but was going to start with the faster crew anyway. We approached the start line with UW athletes and cheerleaders and were welcomed with high fives. And, we were off. We headed out on the scenic on-foot tour of downtown Madison and the UW Campus: around the Capital Square and up Wisconsin Avenue to the Edgewater Hotel. That hill is always welcoming at the start of the race! We then headed through the fraternity/sorority area and to the Memorial Union. 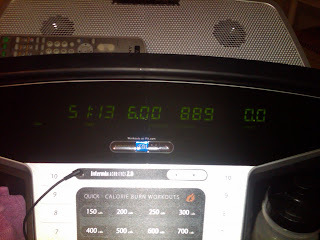 I clocked the first mile in 7:40 --- oops -- the next mile should be fun!! Next, was Observatory Hill. Usually I am running past people in my own wave, up the monster hill. But, since I was with more seasoned runners, I was feeling sluggish and moving slower than everyone else. Deflating ... but smiling, none the less! After several more inclines and downhills, I reached mile two and headed towards the UW clinical campus. The leaders were heading back towards the finish line, as I headed out on the Lakeshore path. I reached the path's turnaround and mile 3 right at 24:30 and was feeling really good. I was carrying my handheld water bottle and didn't need to stop at the rest stops. The last two miles, I didn't push myself, but felt like I was moving at a decent pace. It didn't look like I was going to PR, but I was ok with that. I ran a comfortable pace with everyone else, headed to Camp Randall Stadium, as the theme from Rocky was playing, as it always does. Then the wind was in my face at the last turn and I tried to increase my pace as it tried to push me back. 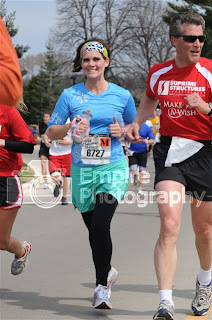 I approached the last half of a mile with a smile on my face and sped up as I entered the stadium and down the chute. I grabbed a quick, cold bottle of water as my handheld was empty and walked towards the bleachers. After declining the free beer initially, I did end up celebrating with a quick beer-and-a-half after all was said and done! Crowds were crazy in the central bleacher sections and getting beer or going to the bathroom over there was no easy task either. We opted to hang out more towards Section A where there was less activity (but, maybe not quite as much fun either!). I was going to meet up with some other runners possibly, but that didn't end up working out either since this year the walkers were coming in at the Section R I designated and the seas of runners/walkers made finding anyone pretty much impossible. and look forward running again next year!